Bella Hardy | The Goose Is Out! 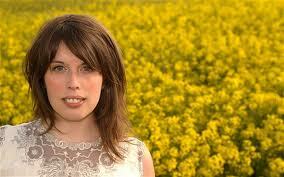 We were delighted to welcome Bella Hardy to the Goose for her first appearance there, accompanied by Anna Massie. Though only 25 years old, Bella has already been nominated three times in the BBC Radio 2 Folk Awards and has been well known on the folk circuit for many years, playing fiddle in a variety of popular line-ups as a teenager and reaching the finals of the BBC Young Folk Awards in 2004. Bella is from Edale in Derbyshire’s Dark Peak and as a child was always singing. Edale was the ideal place to nurture this natural ability, with an abundance of communal song. Having played the fiddle a small amount at school, Bella attended a Folkworks Youth Summer School in Durham age 13. Motivated by the number of young people playing folk music, she was inspired to begin working on folk fiddle. She also met many of her great friends and musical companions. Some of these new friends arranged to meet up again, and on New Year’s Day a year later The Pack was formed. Initially The Pack was a way for this group of people to get free tickets to festivals. The spirited performances and complex arrangements of the 12 piece band proved a resounding success, and they went on to play many of the scene’s greatest stages, including Cambridge Folk Festival main stage in 2003. It was following the launch of her debut album Night Visiting in 2007 that Bella quickly rose to become one of the shining lights of the folk scene, famed for entwining her hypnotic voice with her own fiddle accompaniment to stunning effect. Night Visiting secured Bella a raft of rave reviews, and 2008 saw a packed year of gigs and festival appearances. In July 2008, Bella was invited to perform in two concerts at London’s Royal Albert Hall as part of the first ever Folk Prom. She was given the privileged but daunting task of opening the event with a set of unaccompanied traditional songs and met the challenge with remarkable composure, winning over a host of new admirers. The programme was broadcast simultaneously by BBC4 and Radio 3. She also appeared on BBC2 on Christmas Day, singing the Coventry Carol in Howard Goodall’s ‘The Truth about Carols.